The V‑Studio's front panel hosts XLR and line sockets for the first two inputs, along with the headphone output and the port for an SD card. Take the computer interfacing and control out of the equation just for the moment and you're left with an 8:2 digital mixer with stereo recording/playback built in. The first two mixer channels are both mono and fed from mic/line preamps. Both jack and XLR connectors are provided, and phantom‑power switching is shared. A high‑Z switch on channel one provides a higher impedance at the jack socket for plugging in electric guitars directly. The remaining channels are all stereo, the first fed balanced from TRS jacks, the second unbalanced from RCA phonos, and the third digitally via a coaxial S/PDIF connector. Balanced jacks carry the main stereo mixer outputs, and you can hear the same signal via a front‑panel headphone socket. Each channel has a rotary fader, as does the master output, and the first pair of channels have pan pots too. All other control is via the LCD and the four rotary encoders surrounding it. All but the S/PDIF‑sourced channel have access to a channel processing chain comprising compressor and three‑band parametric EQ in series, and you can send post‑fader from any channel to a no‑frills preset delay/reverb effect. The channel processing has a fair bit of editing flexibility (although I missed a gain‑reduction display), and the encoders make it pretty simple to use, in most cases. The recorder can capture WAV audio to an optional SD-format storage card at 44.1kHz sample rate and 16‑, 24‑, or 32‑bit resolution, and can be fed either from the main mix or directly from one or both of the mic preamp channels (pre‑ or post‑compression/EQ). A built‑in metronome is provided, if you need one, and any recordings you make can be played back directly to the mix bus at a level set by the Playback knob. Loops and marker points are available for navigating through any of the stored files, and there's a special 'background' playback facility that lets you monitor a recorded track while recording a new file at the same time. Once recorded, WAV files can easily be lifted from the storage card for further editing and processing in your computer. The hardware is solidly built and looks like it means business the moment you take it out of the box, sprouting connectors and controls from both front and rear edges, a bit like a dedicated location recorder. This is perhaps no accident, because without a computer an obvious application for it would be location recording. The other main use I can anticipate is small‑scale live gigs, where WAV playback could be mixed with, say, a couple of mics, a keyboard and an amp simulator, before feeding a mixed output to the PA — you could also record the gig too, if you wanted. The main potential problem I could see for live use, though, is that you can't send a separate foldback mix to the headphone socket or one of the other two pairs of hardware outputs; it's the one mix for everything. At the back, things are a little more crowded: all the remaining audio I/O sockets, MIDI I/O, a socket for the external power supply and a USB port for connecting the V‑Studio to a computer. Although the V‑Studio 100's DSP mixer is pretty basic at the end of the day, and its sound to my ears is pretty cheap and cheerful, that doesn't mean that it becomes redundant in the studio, because you can also press it into service for low‑latency monitoring (complete with courtesy reverb) while you're overdubbing to a software DAW. Speaking of which, let's now see how the software side of things fits in. The supplied ASIO/WDM driver can receive audio from any of the eight hardware inputs, and can send six independent audio streams out of the computer. The first pair of these feeds the main mix via the Playback level control, joining any signals coming through the DSP on their way to the main output sockets, while the others route directly to four further hardware output sockets, comprising two balanced jacks and two unbalanced RCA phonos. It makes sense to use the main outputs for your control‑room monitoring and the remaining outputs for independent cue mixes or sends to external hardware effects — in the latter case the driver will let you re‑record the output of the DSP mixer back into your DAW so that you incorporate any hardware effects returns or live synths within your final mixdown file. 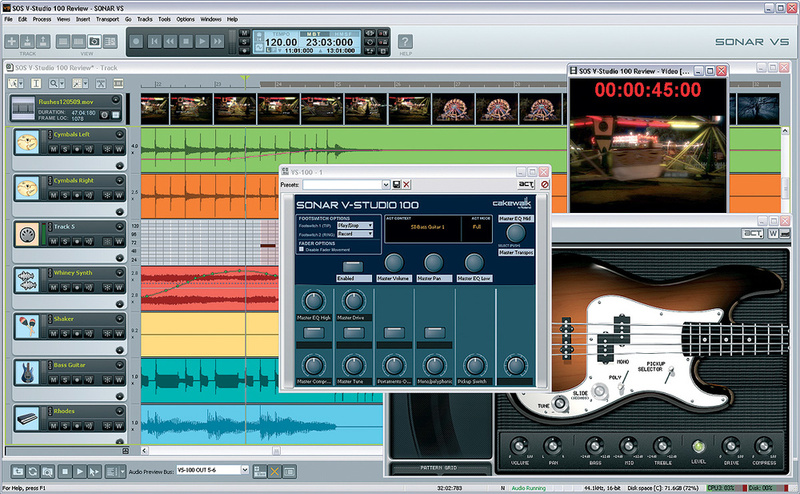 The centrepiece of Cakewalk's wide‑ranging software bundle is the DAW Sonar VS, a PC‑only 'lite' version of Sonar that is nonetheless well‑specified for combining and editing audio and MIDI tracks. The mixing environment is pretty flexible, with configurable sends and bussing, as well as facilities to incorporate external MIDI hardware. You can even import or synchronise to video and work with traditional musical notation for scoring work, and there's a separate Audio Creator LE utility for burning audio CDs of finished projects. Within Sonar VS, the V‑Studio 100 hardware gives you transport control and lets you navigate through your mixer channels adjusting trim, pan, send and volume settings with the Assign Value encoder and touch‑sensitive motorised fader. Mute, Solo, and record Arm buttons also apply to the selected track, and can be re-purposed for Monitor status, Solo Clear and automation Write, using the adjacent Shift Key. This is all useful stuff and worked fine, for the most part, in my tests, although Arm and Monitor switching didn't seem to work for instrument tracks, and I could only access two sends, no matter how many were on a given channel. The other four endless rotary encoders can be assigned to plug‑in/instrument parameters via Cakewalk's Active Controller Technology (ACT). Just enter learn mode, wiggle both the software and the hardware controls, and then exit learn mode to connect them. The ACT assignments are saved for each plug‑in, and the assignments then automatically update to reflect whichever editor window is currently topped. This is a great feature, because once you've set up suitable defaults you can really fly around your plug‑ins — exactly the kind of thing you expect from a closely integrated hardware controller. If four ACT controls aren't enough for you, then switch on the DAW Full Assign mode from the hardware's Utility menu, whereupon the remainder of the rotary controls and switches on the left‑hand side of the unit can also be used. Of course, for the end‑stopped rotary controls there's the potential for mismatch between the plug‑in settings and the physical control positions, so Cakewalk have sensibly implemented a system whereby you need to move a hardware control through the position corresponding to the current underlying parameter value before the software control latches on. The other potential downside to DAW Full Assign mode is that it stops you controlling the V‑Studio 100's internal digital mixer. However, since input settings in the studio are likely to be mostly of the 'set and forget' variety, I don't think anyone will be too narked. Cakewalk's cut‑down but capable DAW software, Sonar VS.
A usable general‑purpose suite of 14 Cakewalk plug‑ins is supplemented with better specified Sonitus EQ and Reverb effects and Cakewalk's more fully featured Channel Tools (a utility plug‑in with metering, M&S matrixing, phase inversion, and precise channel delays), Boost 11 (a mastering‑style peak limiter), and VX64 (a channel multi‑processor with de‑essing, dynamics, EQ, ADT, delay and various stages of emulated tube saturation). It has to be said, though, that I didn't think any of these plug‑ins sounded particularly stellar. Even the snazzy‑looking VX64 didn't really live up to its looks, either in terms of control set or sonics: both the compressor and the de‑esser struggled to work transparently, the doubler sounded very synthetic, and the saturation rarely seemed to add something that I really wanted. However, while you won't find much magic here, you do still get some solid tools for everyday mixing tasks. What's more, a version of Native Instruments' Guitar Rig 3 also included as part of the bundle features a lot of decent and characterful mix effects alongside its core amp‑emulation modules, mitigating the situation a great deal. Where Cakewalk score much better is with a generous collection of bundled virtual instruments. Between them, Roland's Groove Synth and Cakewalk's 16‑channel TTS1 GM2 module provide the guts of a bread‑and‑butter multitimbral sound module, and both allow a good deal of editing too. More authentic and musical sounds are added to this foundation set via four Studio Instruments: Bass Guitar, Drum Kit, Electric Piano and String Section, each of which does pretty much what it says on the tin. Each of these plug‑ins provides various preset instrument types and a small set of controls to refine them, and you can also trigger little MIDI phrase snippets from themed categories presented in a separate browser pane. If you like what you hear, drag that phrase into your arrangement, or drag any useful MIDI regions out of your own track into the plug‑in window for re‑use elsewhere. The Bass Guitar and Drum Kit instruments are the best of the four, to my ears, and both provide a good, meaty sound with reasonable velocity response. Electric Piano is also nice, but suffers from having too few velocity layers on occasion, and it's tricky to avoid String Section sounding mechanical even though the raw samples often sound decent in isolation. Despite these few niggles, though, the combination of these instruments does provide a huge number of respectable track‑fillers, and they're a great asset to the product as a whole. The bundled synths are even better, including cut‑down 'LE' versions of Cakewalk's Dimension and Rapture S&S synths, the simpler Dropzone sample/REX2 player, and the three‑oscillator Square 1 analogue‑style subtractive synth. Not only do these instruments give you lots of different ways to create and manipulate sound, including analogue‑style sequencing and vector‑style waveform‑morphing, but each has a really good selection of multisamples, wavetables and presets, which I found quite inspiring. Overall, I have to say that my experience with the V‑Studio 100 was a pleasant one. The hardware seems robust and fairly logical in use, and I like the feel of the fader and rotary controls. The socketry is well‑judged, although I do find it a bit odd that the phantom power switch is on the back of the unit, rather than by the preamps at the front, and the preamp gain controls seem to have quite a lot of gain bunched at the upper extreme of their travel. The power‑cable retainer hook will be appreciated in live situations, but I'd have liked some kind of safety clip for the SD‑card slot as well, to prevent the card being popped out inadvertently, especially given the stern warnings against this in the manual. The headphone socket is well placed on the front edge of the box, but it did feel a bit under-powered, to me, when using headphones with higher impedances, so you may need to take care choosing headphones. The LCD is great: backlit, with adjustable contrast, and, although not raked forward, clearly readable across a wide viewing angle. As with any audio interface unit, the preamps are probably the main concern in terms of audio quality. The good news is that their circuitry sounds really good, to me, compared with a variety of other preamps in my collection: neutral enough to capture the complex harmonics of chordal acoustic instruments with some fidelity, but also imparting a stiff dose of additional 'air' to the extreme high frequencies that would suit anyone who likes a strong sense of clarity in their recordings. You might just need to be a bit careful with singers, as there's no mercy for excess sibilance or lip noise. Some musicians might prefer a slightly warmer low end, but while the V‑Studio 100 preamp isn't particularly forward in this area, I didn't actually feel it was significantly lacking either. Not quite such good news, though, was that the preamp came across as noisier than other recent audio interface preamps I've tried (for example, the Lexicon Ionix range and ART's Tubefire 8), and indeed than a variety of other preamps I've heard in other gear (Mackie's VLZ3 and Presonus XDR preamps, for example, and those in the Dbx Model 376 and TL Audio Ivory 2-series recording channels). That said, it's still more than quiet enough for most project‑studio tracking and overdubbing tasks, and I wouldn't really worry unduly about it unless you do lots of critical distant miking work or you plan to use low‑sensitivity ribbon mics. Furthermore, because Cakewalk have sensibly provided an S/PDIF digital input socket, you can bypass the internal preamps completely if you have a higher‑quality preamp and A‑D converter unit to hand. On the software side, you get an awful lot for your money, and the different elements of the software bundle complement each other well. Sonar VS is a very capable little application and it works very nicely with ACT, but Guitar Rig 3 and Cakewalk's bundled virtual instruments are also serious selling points in their own right, even for those whose choice of Apple computer hardware robs them of the benefits of Cakewalk's supplied DAW software. When I first surveyed the V‑Studio 100, I was suspicious that the 'little bit of everything' concept might give rise to a rather diddy product, with not enough depth to any of the functions to make it really useful to musicians. However, while this is an easy trap for manufacturers to fall into, I think that Cakewalk are treading a good line here. To my mind, even if you completely ignore the hardware digital mixer and solid‑state recorder, the closely integrated 'interface plus software' package is already pretty attractive. That the mixer and recorder provide enough hardware to drive a small live gig is a significant added bonus, and for those who appreciate this kind of dual functionality it'll make the V‑Studio 100 a hard act to beat. The V‑Studio 100 combines so many features that there's little that's directly comparable from other manufacturers at this point (with the possible exception of Zoom's new R16, which is reviewed elsewhere in this issue), so competition only really becomes an issue if you feel that some of the V‑Studio's features will be redundant for you. For example, if you didn't want the stand‑alone mixer and solid‑state recorder functions, you could piece together something comparable with an M‑Audio Fast Track Ultra, a Frontier Designs Alphatrack, and Sonar Studio Edition, for example. What About Other Sequencing Platforms? Although the V‑Studio 100 hardware has been designed to work particularly closely with Sonar VS, it will also interface with any other software that accepts its WDM or ASIO 2.0 drivers. I tried it with both Reaper 3 and Cubase 5, and was able to achieve clickless audio recording at the lowest, 96‑sample, buffer size, with a respectable declared throughput latency of 9.5ms. 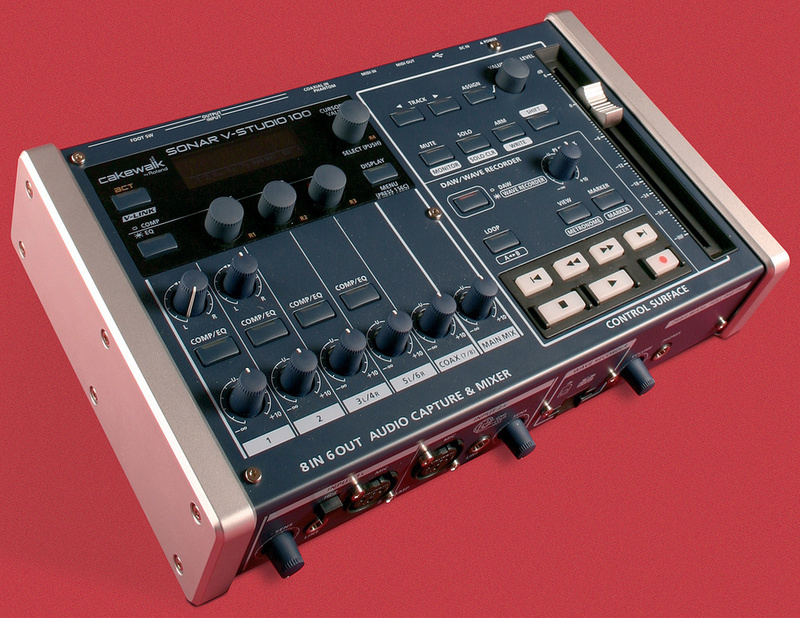 Outside Sonar VS, most of the controls in the right‑hand half of the V‑Studio 100's top panel are available for DAW control using the Mackie Control protocol, but you can't access any of the other rotary controls, frustratingly. Solid, well‑thought‑out hardware that lends itself to stand‑alone applications such as location recording and live sound. Sonar VS is a good budget DAW, and the ACT system makes it much more of a pleasure to work with. The software bundle includes Native Instruments' Guitar Rig 3 LE and lots of good Cakewalk instrument plug‑ins. Sonar VS and ACT unavailable to Mac users. The internal DSP mixer cannot access four of the six outputs — these can only be used for DAW outputs. Lacklustre processing in the DSP mixer channels and bundled Cakewalk plug‑ins. The preamps are not the quietest I've heard, nor is the headphone amp the loudest. Cakewalk's V‑Studio 100 already scores well by combining a solid interface with a decent software suite, but the hardware's stand‑alone mixing and recording functions make it even more attractive to those creating music both inside and outside the studio environment. Value for money on the software side isn't as good for Mac users, though. Edirol Europe +44 (0)202 8747 5949. Sonar V‑Studio 100 firmware v1.19. Sonar V‑Studio WDM/ASIO driver v1.00. Rain Recording Solstice O3 PC with AMD Phenom II X4 810 quad‑core 2.61GHz processor, 4GB DDR2 RAM, and Windows XP Pro with Service Pack 3 v3264.